After 6 months I am happy to release my most recent photo called Visual Acoustics VIII – Silence and Light – New York City Sunrise. The reason I’m not very productive is that I’m also very critical at what I do and publish. In my case it’s not just a case of creating a nice photo. I always try to incorporate a photo into a specific thematic series. In this case the photo will be part the Visual Acoustics – Silence and Light series in which the emphasis is on how shadows evoke mystery and remove visual noise and hence create visual silence. Shadows to me are synonymous to silence and mystery, a notion I derived from architect Louis Kahn’s concepts behind his architectural creations and writings. 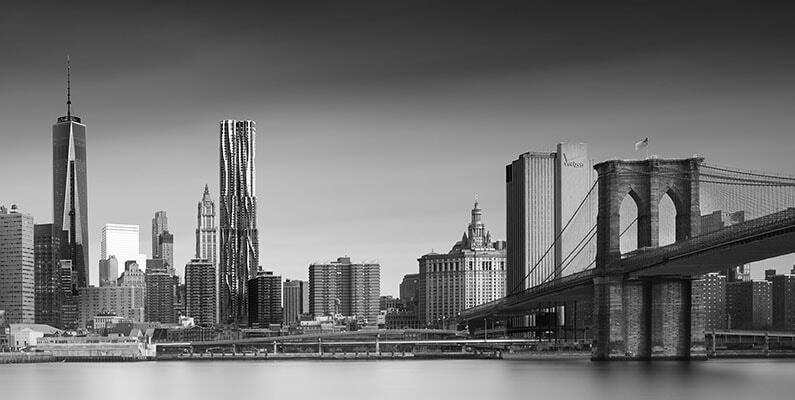 The New York City skyline obviously is a much photographed subject, but I believe that it isn’t the subject that makes your photograph an original creation, it’s the interpretation you give to it that makes all the difference. Composition is of course key but try to come up with an original composition if it has already been photographed in a million different ways. 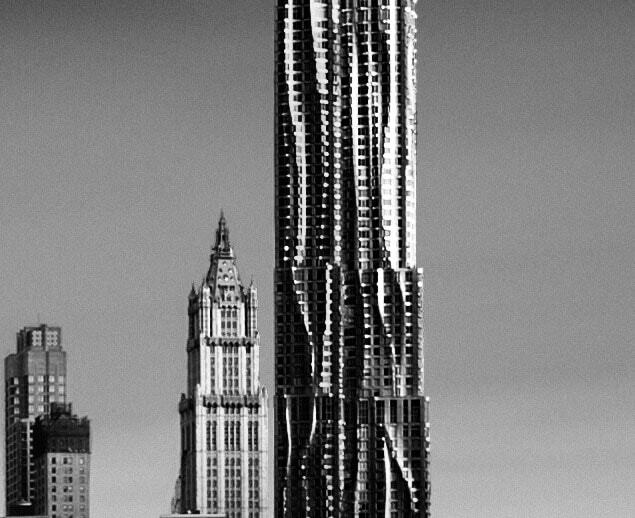 Therefore the key to come up with what I hope will be an original skyline shot of New York City is to utilise my specific black and white photography ideas on this. In this post I will try to demonstrate how I processed this image from a conceptual point of view. As mentioned earlier, the concept behind this image is to put the emphasis on shadows and to be able to do that I need to shape and manipulate the light. 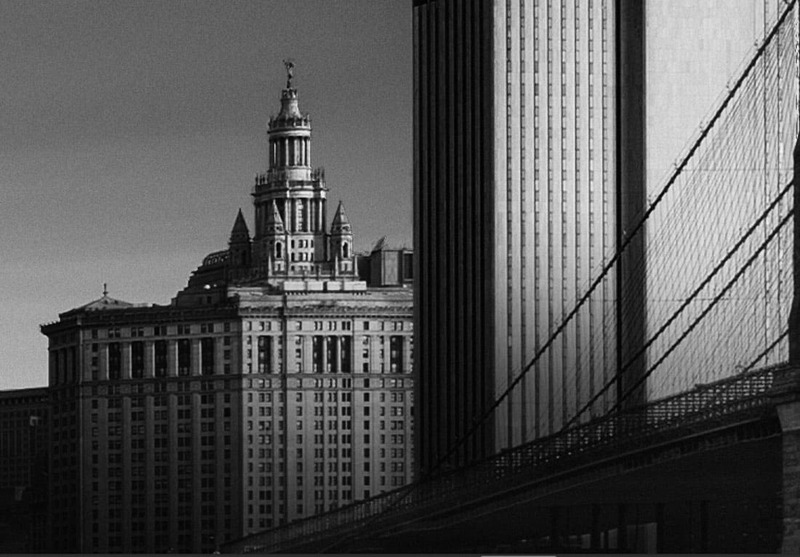 Creating shadows to remove the typical visual noise of any big city, especially New York’s, to induce and introduce visual and psychological silence and minimalism even in a crowded skyline such as New York’s and evoke mystery. 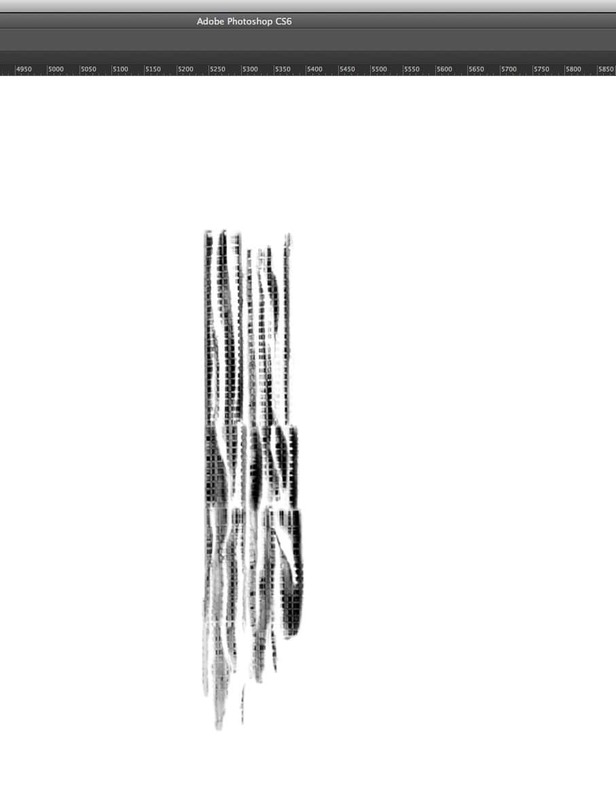 That is the essence of my Visual Acoustics series. Here is the original colour photo of the New York City skyline shot as 3 separate images using the shift movement on my tilt shift lens. Stitching those 3 images together is very easy if you create the panoramic shots using the tilt shift lens: there will be no distorted lines. 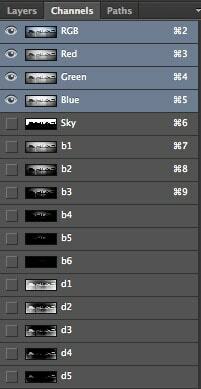 For every image I used 16 stops of ND filters from my own Formatt-Hitech JT signature edition kit. Each separate image is shot with f/7.1 with the t-s lens in neutral position, maximum left shift and maximum right shift. Exposure time varies from 4 to 6 minutes. As you can see the shadows I had in mind were not there, so I had to create them in post production. It looks like a nice skyline photo but not very original. First thing I did before converting it to black and white is to create one selection of the sky only and several luminosity masks as you can see below. I created the luminosity masks out of the original colour photograph. Usually I also create luminosity masks from the black and white photograph in a fairly advanced stage of post processing since the distribution of light in that version can be quite different than in the original colour photograph. The normal hard selection of the sky and the luminosity mask selections will enable me to control the 2 main characteristics of this photo: control shape and control light. As you see I don’t create any separate selections for the building but despite that I will have complete control over every aspect of the image by using the hard selections and luminosity mask selections in an effective way by adding, subtracting and intersecting selections while at the same time use the gradient tool as propagated in my iSGM 2.0 method of Black and White photography conversion. Please refer to the book From Basics to Fine Art to read in detail about this and my concepts. Frank Gehry’s 8 Spruce Street building with a few other buildings in the background that I all separately processed using a combination of hard selections, luminosity masks and the gradient tool from my iSGM 2.0 method. Finally an screenshot of how I was drawing in the shadows and highlights using luminosity masks for the Gehry 8 Spruce Street Building. That’s the kind of attention I pay to every little detail in my photos. Drawing in the shadows and highlights manually in the 8 Spruce Street Building using Luminosity masks and the manual brush. I’ve added the shadows in the skyline for reasons I mentioned before and to give it my specific signature style by applying the gradient tool like below and then by manually adding more shadows and highlights to specific buildings in the shot. 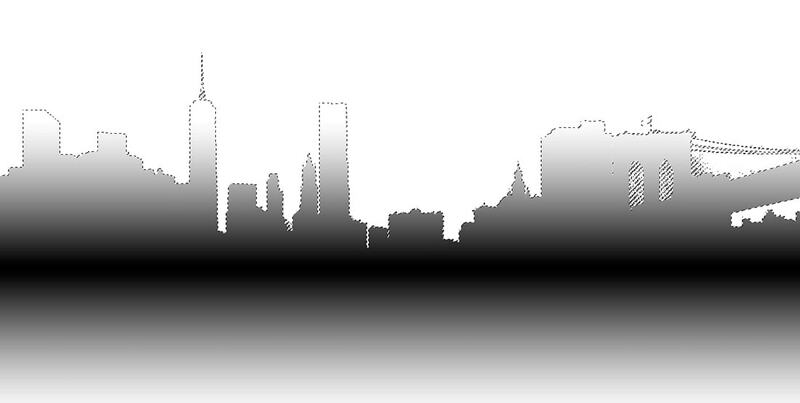 Using the reflected gradient tool to add the shadow base to my skyline photo (in mask mode with a hard selection to exclude the sky) and then manually refining the shadows across the complete skyline. The layer mask is added to the active layer that is on top of an underexposed layer to mask in the shadows to the current layer. 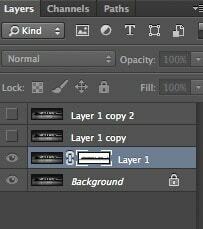 The layer mask as added to the current active layer that I’m working on. The Background layer has been underexposed using the curves tool. By using the gradient tool I can add the shadows in a subtle way in the active layer. If you want to know more and in more detail about iSGM 2.0 and the thought process of creating images like this, and create images like this yourself, then you can purchase the eBook From Basics to Fine Art by yours truly and co-author Julia Anna Gospodarou from our web store and we will be in touch with you personally on how to get the offers once you purchase the book or have purchased it. We will go into detail on this and the concept of Photography Drawing, iSGM 2.0, vision, use of tilt-shift lenses, architectural photography and much more in this book.